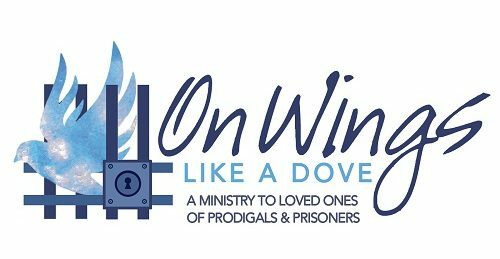 Welcome to our website “On Wings Like a Dove.” My name is Sandra Kearns and I am the mother of a prodigal/prisoner. My journey began many years ago when my son Robbie became involved with drugs and alcohol. Like most parents I didn’t know who to turn to or where to go for help. My son was 14 years old when he first experimented with drugs and began drinking alcohol. At the age of 17, he spent 30 days in a county jail. From his first arrest to my first visit to a prison and seeing him in a prison jumpsuit, I have run the gamut of emotions from helplessness, powerlessness to despair. I know the depths of pain and sorrow of having a prodigal whose has left home. I know too, the roller coaster ride of hope and joy believing my prodigal had returned home only to leave again. “The Lord says, Refrain your voice from weeping; and your eyes from tears, for your work shall be rewarded, and they shall come back from the land of the enemy. There is hope in your future, says the Lord that your children shall come back to their own border” Jeremiah 31:16-17 (Living Bible). I feel God has called me to help other families through On Wings like a Dove ministry. My prayer is to offer you the same hope and encouragement I found in God’s Word. To walk along side of you, to pray with you, offering words of comfort and strength. Years ago, I had the opportunity to meet the author Henry Blackaby at a conference. He gave me the most encouraging words when I felt desperate and ready to give up on my prodigal. His was a simple prayer, and I cling to it everyday, “Lord, help this Mother never to give up.” This is my prayer for you! I encourage you to grab hold of the Lord’s hand. I will help you to be empowered by your relationship with the Lord Jesus Christ, to be defined by His love not by the experience. Through your relationship with the Lord, you will experience the power of choosing Love rather than turning away. If you prefer to have someone pray with you, I encourage you to fill out the prayer request. One of our prayer partners will contact you in a timely manner.